Today I am excited to share with you what I made for the La Conner fabric blog tour :)! 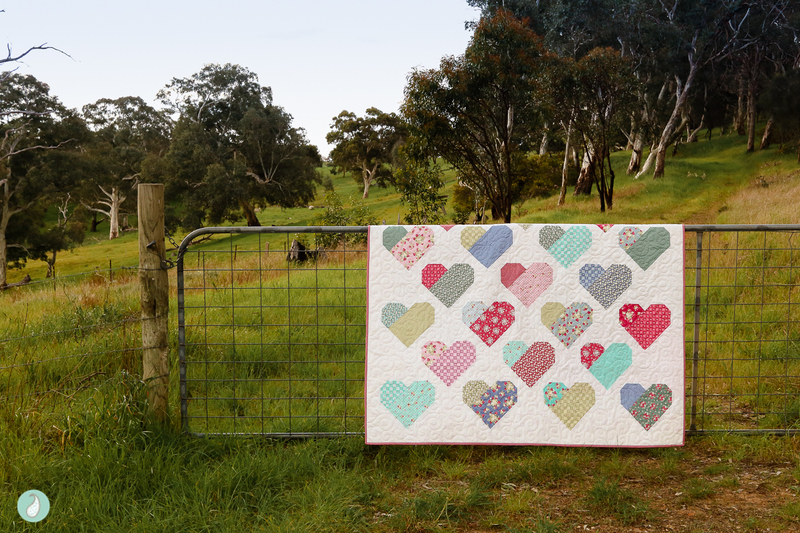 La Conner is Jera Brandvig’s second collection for Lecien – you can read about her initial inspiration and see lots of images of the full collection, on her blog – Quilting in the Rain. I love to know what inspires a designer to create their collection, and how they ultimately interpret that inspiration. I love the glimpse you get into the designer’s personality. And, I love to see if a collection resonates with me for the reason that inspired them. Or, if it inspires me for an entirely unique reason. In this instance, since I haven’t visited La Conner, what I connected to immediately was Jera’s colour palette and the memories I associate with the hues. I particularly love how Jera has taken classic country inspired colours and modernised them, making them feel fresh and bright. 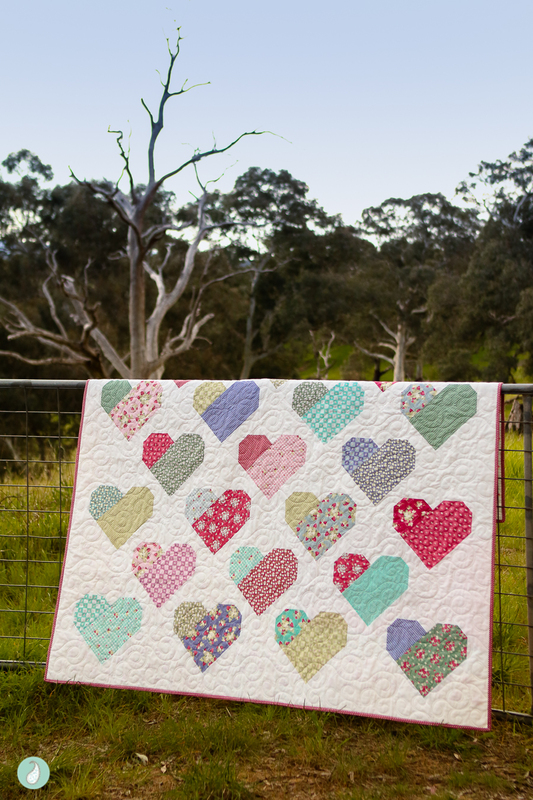 The reason I decided to make a version of my Down Memory Lane pattern was because of how much this colour combination reminded me of the colours I chose for my daughter’s original ‘heart quilt’ – which was the inspiration for the Down Memory Lane pattern. I loved the idea of revisiting that first ever quilt with a modern perspective! Colour has such a strong influence on my memories and emotions! According to Jera, the colours in this collection are: “cranberry, peony, sage, evergreen, blueberry, wicker and rain.” It’s so easy to envision the quaint town of La Conner, just by thinking about the collection of colours! For this quilt I omitted the wicker prints. The reason I did, was simply to ensure there was significant contrast between each of the hearts and the white background. If you like a patterned background fabric, then the wicker prints would be a great option. 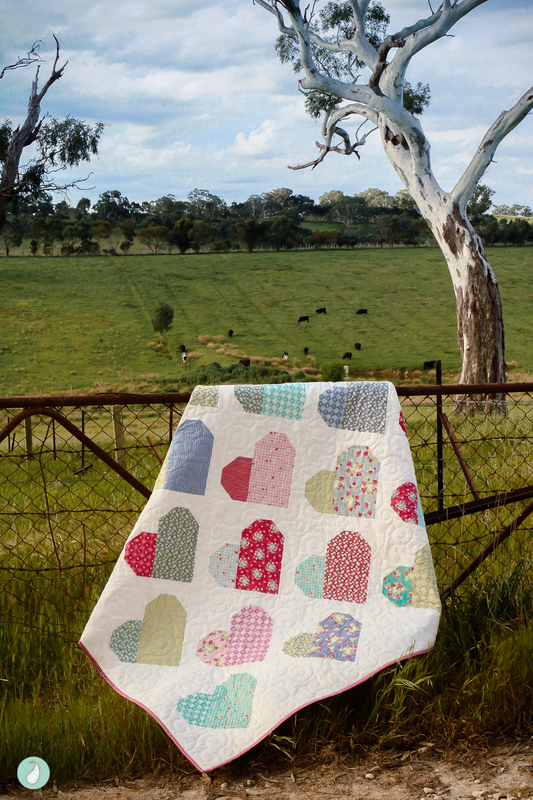 Once I had found my emotional connection to this fabric, I decided that a large block version of my Down Memory Lane pattern would be a great way to showcase larger pieces of fabric. Piecing this quilt was an absolute pleasure. 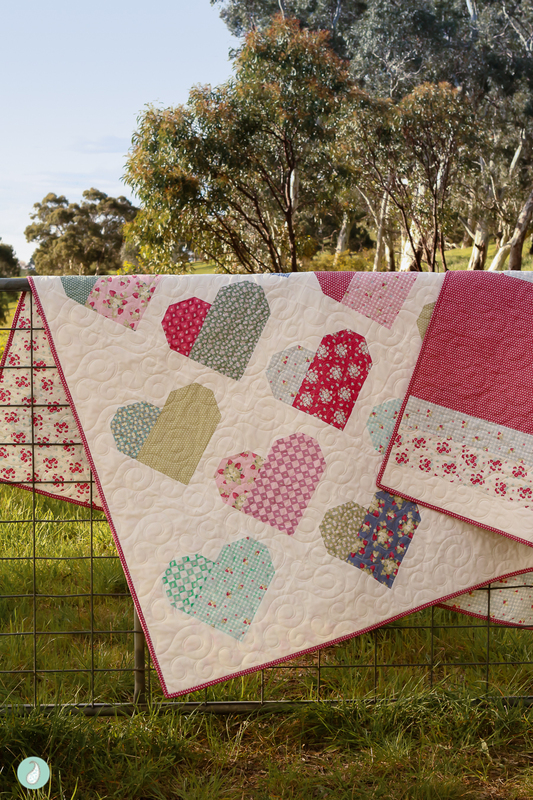 The pattern is simple to construct and it’s a quick project to stitch – and even quicker with these large blocks. 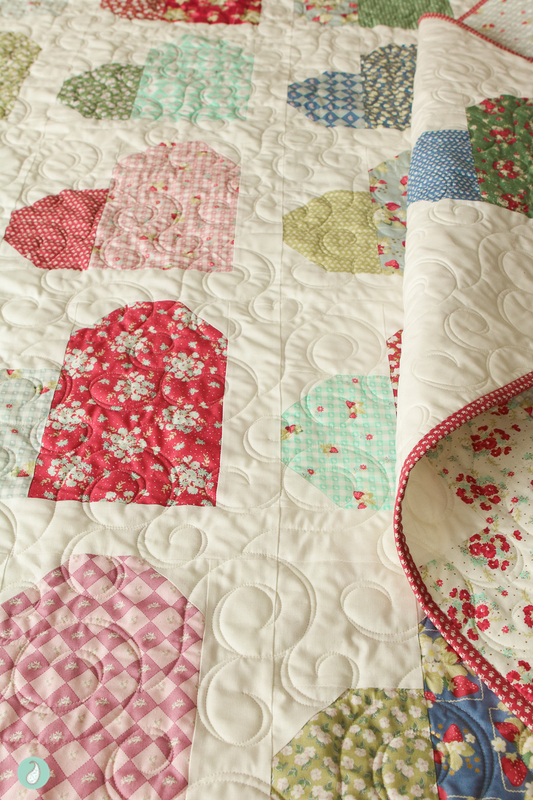 In order to give the pattern an element of whimsy, I decided to mix and match fabric in each block. This fun alternative showcases how well the colour and pattern in this collection play together. I loved the final result so much that I decided to include this block size version as a bonus in the Down Memory Lane pattern I recently released. I gave it a different name to differentiate the block size and setting, but ultimately the block construction technique is the same. For the backing, I pieced together 3 of the fabrics from the collection, plus a little strip of background. When I purchased my backing fabric I didn’t yet know what I was going to make. This meant that a little bit of creative piecing was required to make what I had on hand work for the quilt – but I love the extra charm the pieced backing provides! The tiny floral in the collection makes for the perfect binding – almost reading as polka dots from afar! 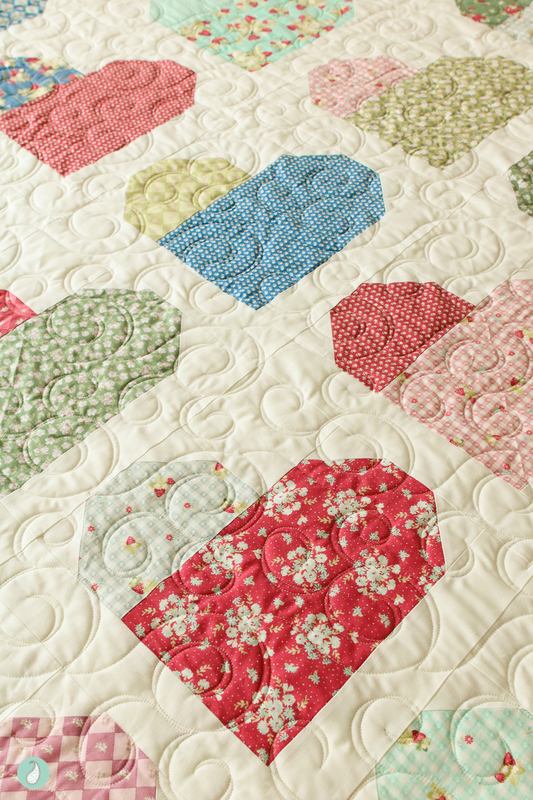 The quilt was professionally quilted on a longarm machine using a pantograph called Embellish by Urban Elementz. I think it was the perfect choice to complete this quilt! For more inspiring projects made with La Conner fabric, check out the following makers blogs and Instagram accounts. I hope you are inspired to make something with La Conner fabric today :). PS. 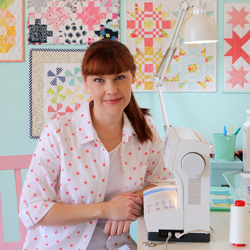 If you would like to make your own Best Loved Memories quilt, or Down Memory Lane quilt , the pattern can be purchased as a PDF here. :). Ohhh Samantha! 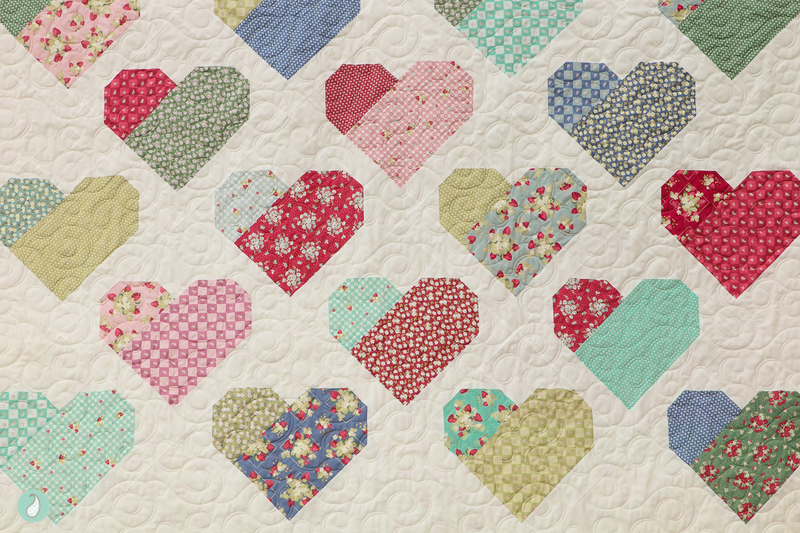 You put sew much love into this quilt! 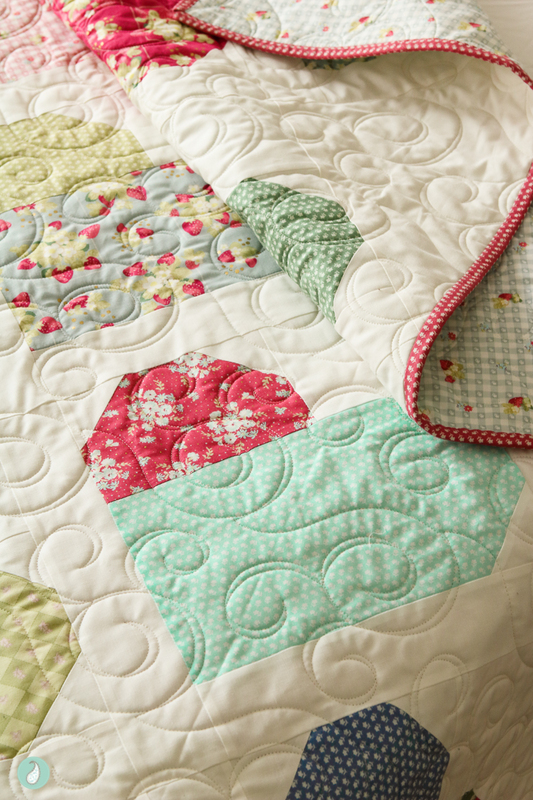 Everything from the quilt itself and lovely pattern, to the gorgeous photos! I’m all heart eyes!!! Thank you girl for sharing your project and inspiring us all! Thank you Jera! It was my pleasure!! I’ve said it before, but I absolutely love your pieced backings! I really want to try this-I just need to settle down & do it! 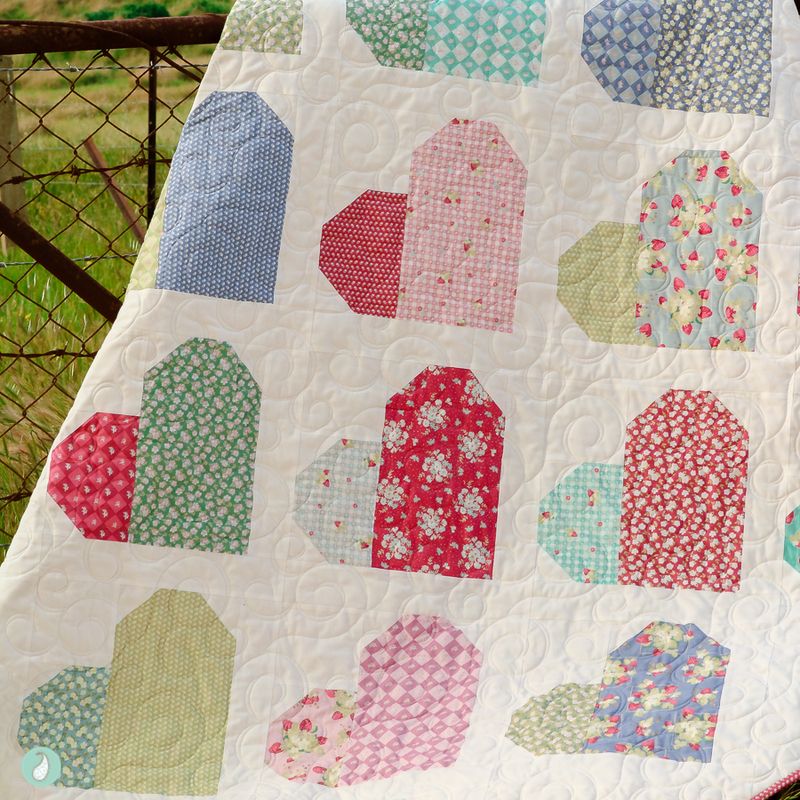 Your quilts always inspire!